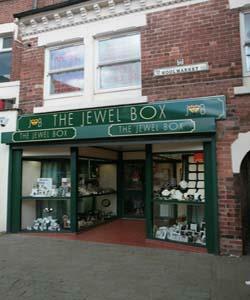 The Jewel Box01977 79555678work Shop - JewelleryIndependent means most of our gold, silver and precious stone set jewellery is hand made and unique. We can source jewellery from many different suppliers ensuring the customer of high quality, exclusivity and good value. We stock a good range of watches from Citizen to Bench at prices to suit most people. We have a comprehensive repair service on jewellery and watches and watch batteries are £1.95 fitted. Independent means most of our gold, silver and precious stone set jewellery is hand made and unique. We can source jewellery from many different suppliers ensuring the customer of high quality, exclusivity and good value. We stock a good range of watches from Citizen to Bench at prices to suit most people. Our staff are friendly and local. We have been trading for over 20 years and have other brances in Retford and Worksop. Open Monday to Saturday 9am to 5pm. We open Good Friday, Easter Saturday, Easter Monday and August Bank Holiday Saturday but are closed all other Bank Holidays. Leave M62 at Junction 32 and follow signs for the town centre (2 miles approx). The town centre is also about 2 miles from the A1. Ample parking at Morrisons, Tesco or other town centre car parks.